I have been playing with Oracle Application Express (APEX) to make a few applications, but I have never been bothered to switch from the default Embedded PL/SQL Gateway (EPG). However, after becoming a little bit familiar with APEX and its different configurations, I became interested to explore other ways of deploying APEX. The purpose of this post is to document the switch-over of my APEX deployment from EPG to APEX Listener. The OS of the server is CentOS 6.4. 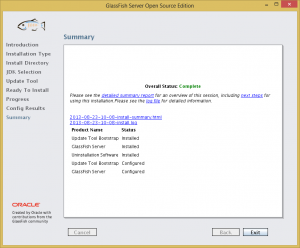 I installed Oracle Express Edition (XE) 11gR2, with which APEX 4.0 is included. 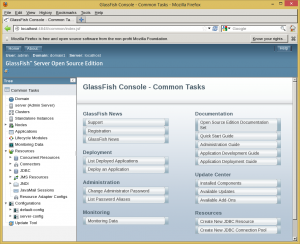 I then upgraded APEX to 4.2.3, and installed GlassFish 4 Open Source Edition on the server. Next, configure the APEX_PUBLIC_USER user. After that it is time to disable EPG. Next, go into the APEX unzipped directory and run the configure restful services script. Then, grant connect privileges to the APEX_040200 user. Download and unzip APEX Listener. This Listener instance has not yet been configured. # java -jar apex.war user adminlistener "Listener Administrator"
I have been reading up on Oracle APEX Listener, and I want to try using it to serve Oracle APEX instead of the Embedded PL/SQL Gateway (EPG). EPG is the default option for the APEX that is included in Oracle Database XE; it works, but many of the features of APEX like RESTful services cannot be used with it. Oracle APEX Listener must run on top of an application server, and the only supported servers are Oracle WebLogic and GlassFish Server. 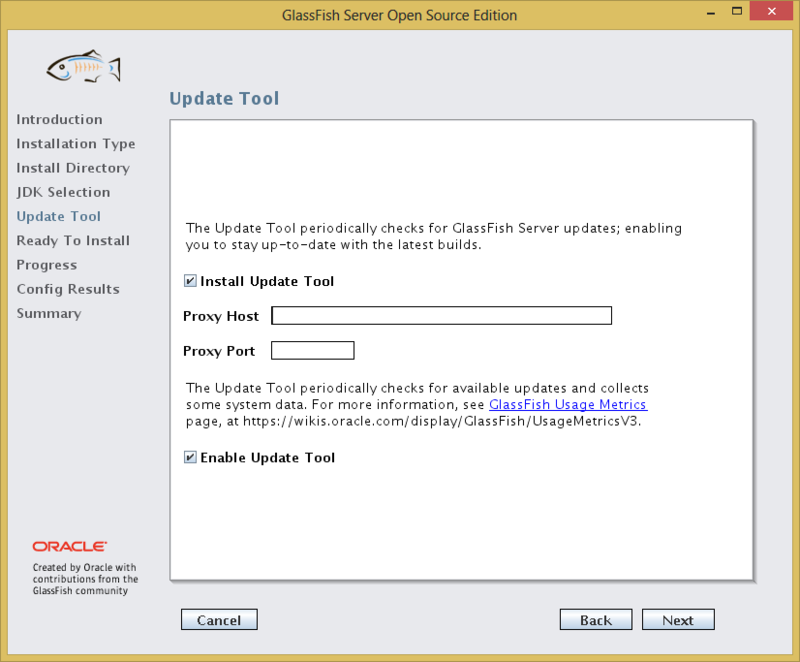 Since WebLogic costs money, the free way to try APEX Listener is by first installing GlassFish Server. 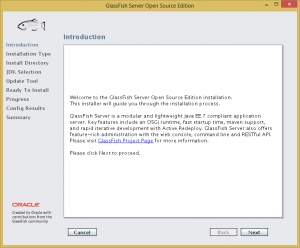 This post is intended to document the process of installing GlassFish 4.0 server on CentOS 6.4. Let’s start with a minimal CentOS 6.4 installation. Then, install Java SDK by going to the Java SDK Download Page (via a desktop, as wget won’t work) and copying the rpm over to the server. Proceed with installation of the rpm. 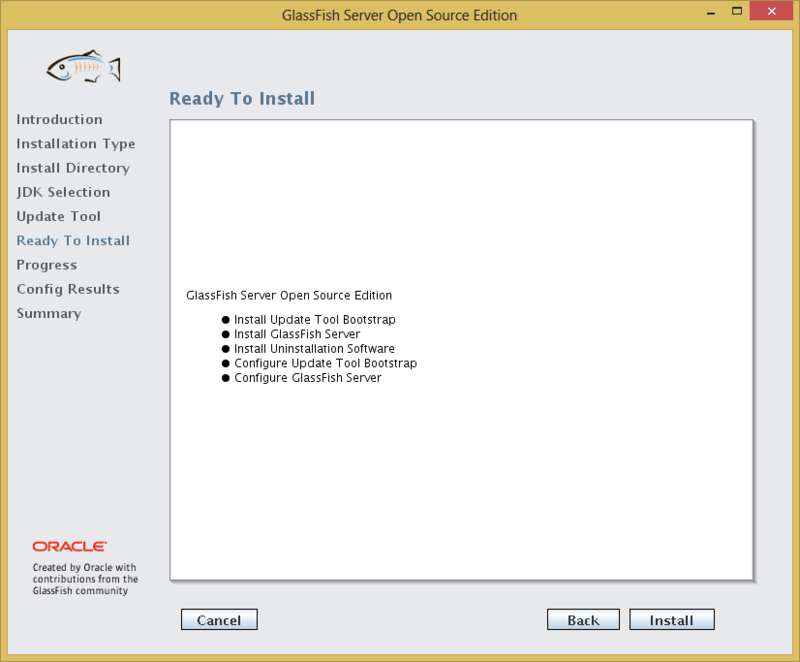 After that, grab the GlassFish Server Open Source Edition installer from the GlassFish Server website. The installer chosen above is a graphical installer (there are other install options, which will not be covered in this post), so we will need to install x11 and configure forwarding with SSH. Ensure the hostname of the server can be resolved via DNS (the installation will flag errors during the config stage if the server hostname is not resolvable. 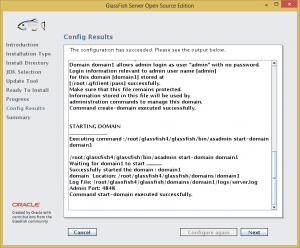 Login again via SSH and enable X11 forwarding, and run the installer. The graphical installer will then load. The next page is supposed to give a choice of installation type, but only one type (Typical Installation) is available. In the next page you can specify the directory in which you wish to install GlassFish Server Open Source Edition. 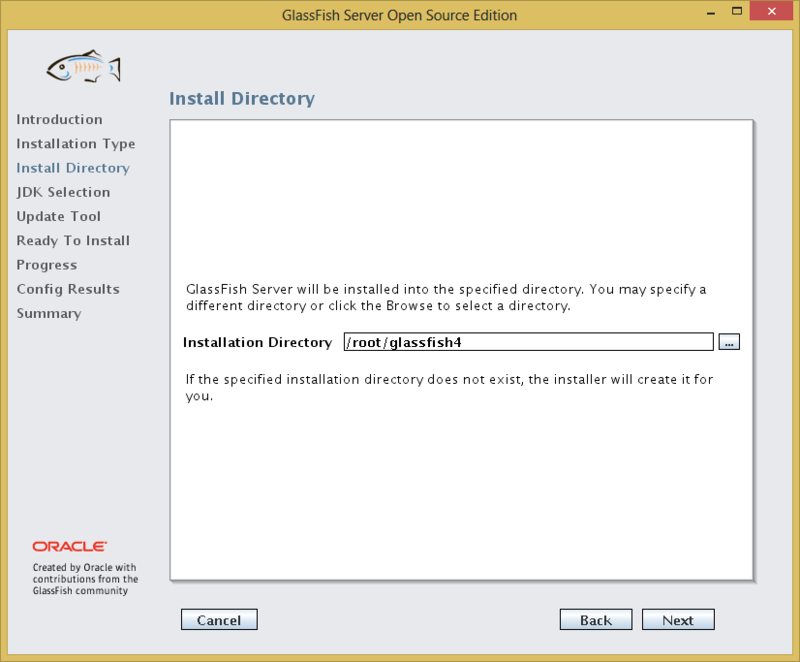 The default directory is ~/glassfish4. I will accept the default. Click Next. 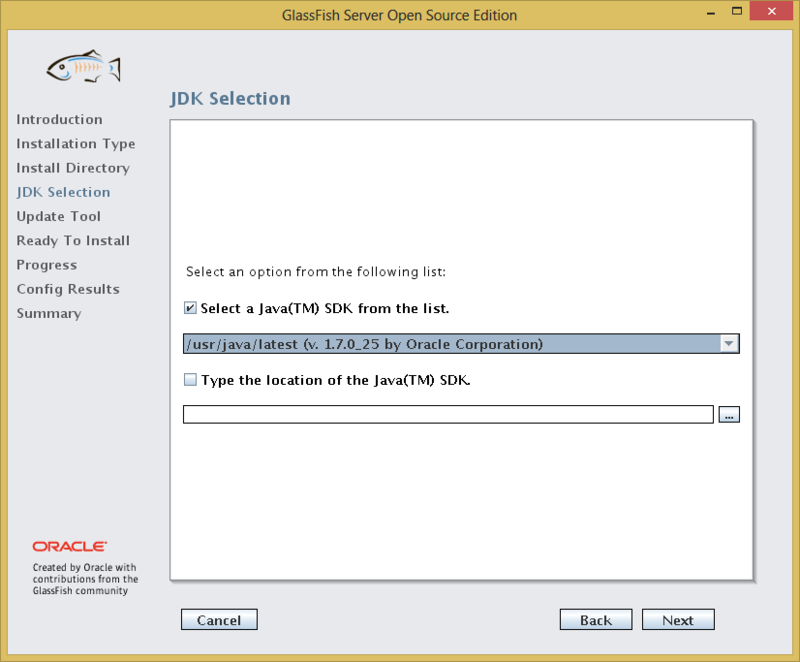 The next page is the JDK selection page. 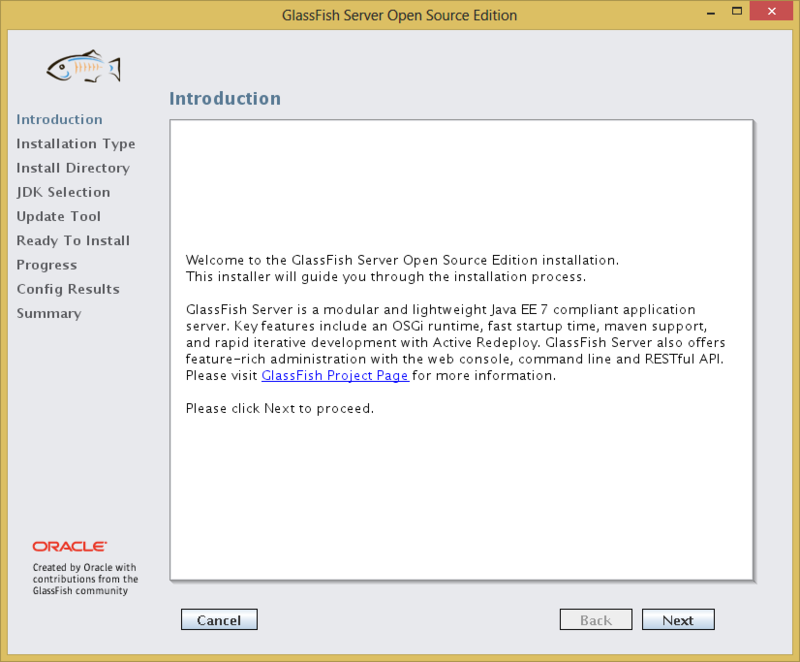 The installer has detected correctly the JDK which was installed earlier. 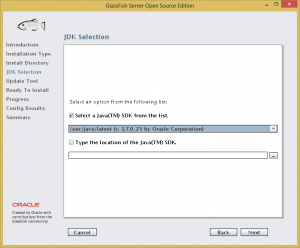 There is an option to type in another custom location of any JDK you want to use instead. Click Next. Next comes the update tool page. 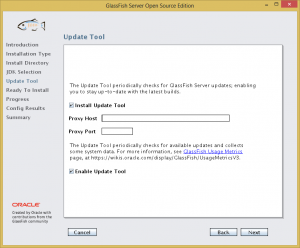 The installer will install an update tool that will check for GlassFish Server updates. You can uncheck this if you want. I will leave it installed. Click Next. Then comes the summary page before finalising the install. 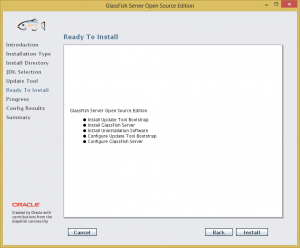 After the installation has finished, the installer will perform some configuration, and the next page will show the configuration results. Take note of the Admin Port. In this case it is 4848. Click Next. Finally, the installer will show a summary of the installation. 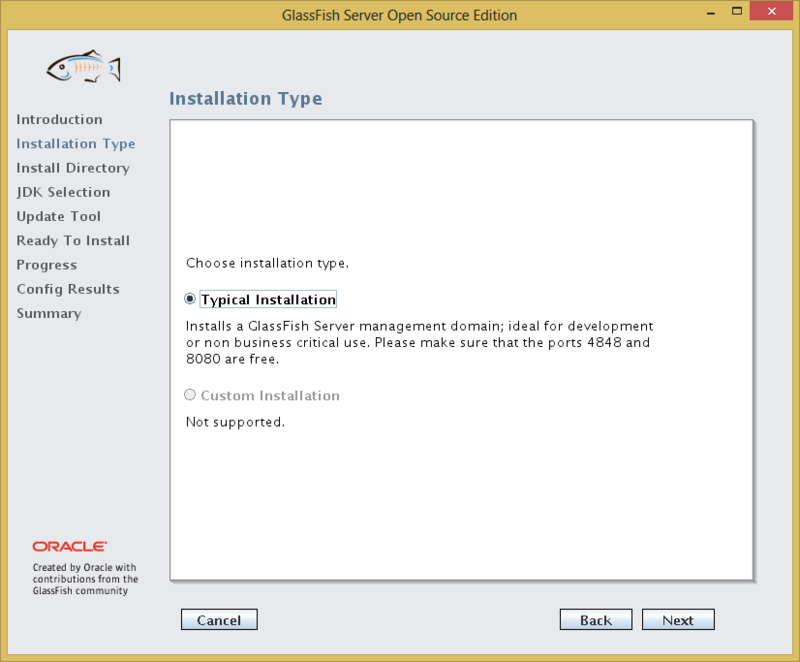 By default, the GlassFish console running on the Admin Port (4848 as noted during the installation) will not accept remote connections. Therefore, we have to run a browser from the server itself. 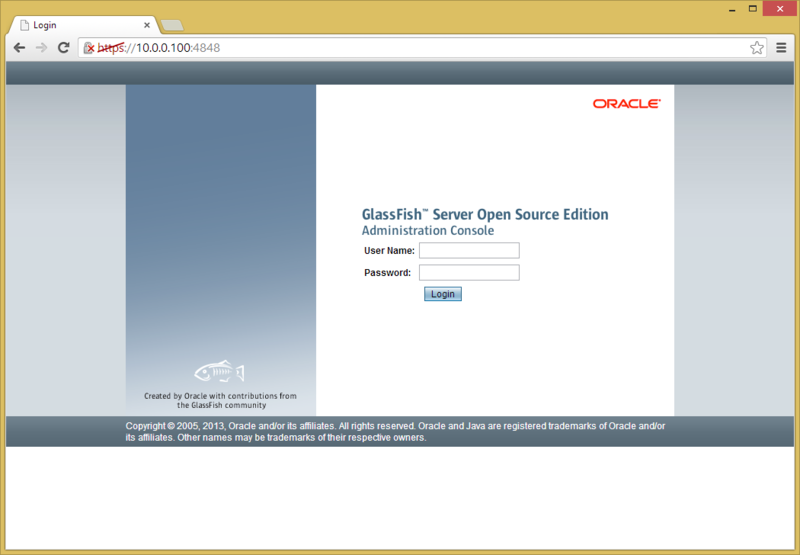 Key in localhost:4848 to the address bar, and the GlassFish console will load! 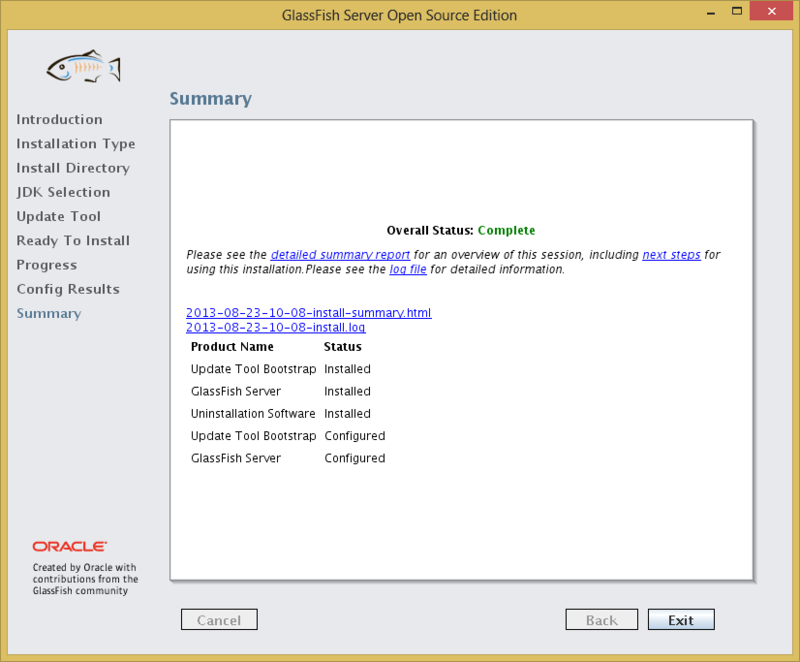 GlassFish Server Open Source Edition is now ready to be used. 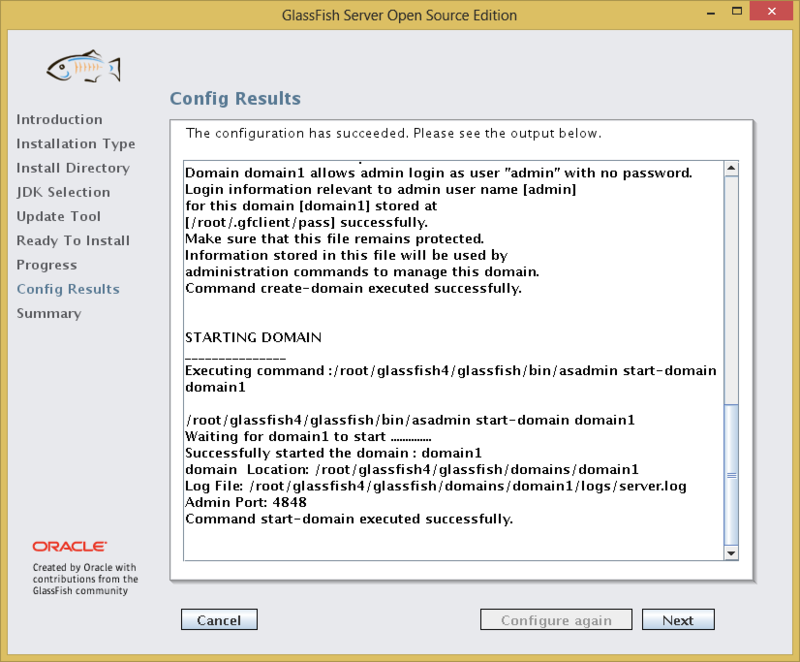 The command failed because the default password for the GlassFish Console admin is blank. We need to set it to a non-blank password before enabling secure admin. Now try the enable-secure-admin command again. Restart the domain for the changes to take effect. Don’t forget to open up port 4848 at the firewall. 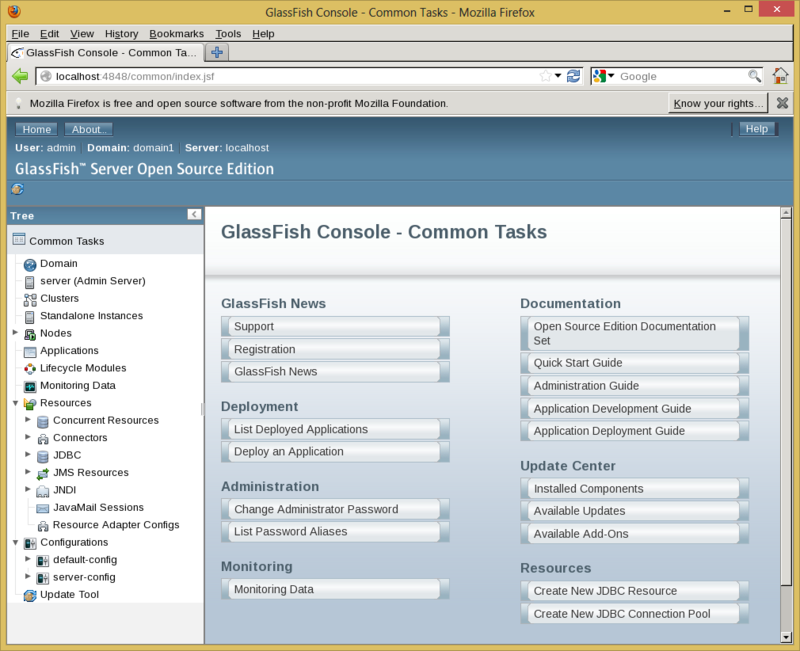 Now the GlassFish Console is accessible outside of localhost. 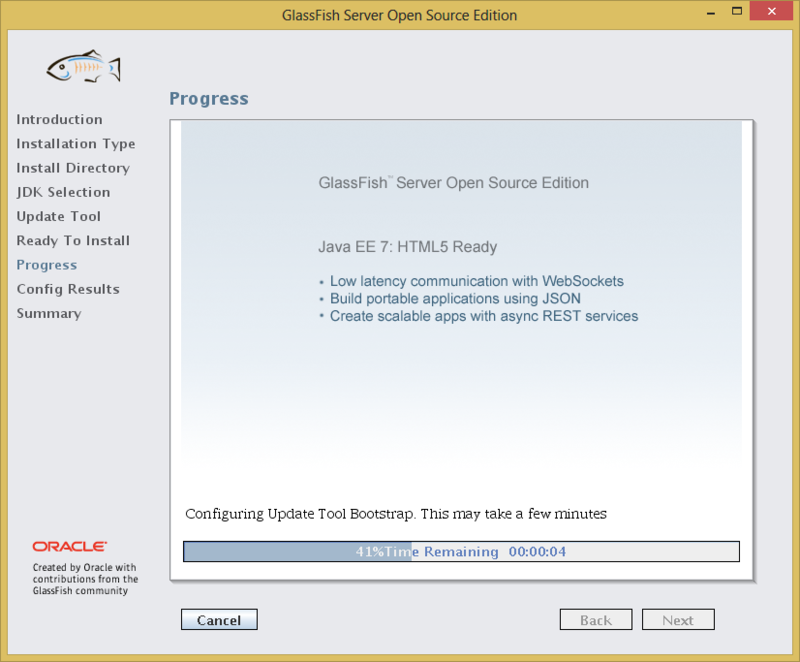 Key in hostname:4848 in the address bar of your browser, and you will be presented with the GlassFish Console login page. Your browser might throw a certificate error due to the self-signed certificate; just ignore this and add an exception. User Name should be ‘admin’ and the password will be the password you keyed in during the change-admin-password command earlier. The resources above have somewhat conflicting information about upgrading to 4.2.4. The installation guide lists a long set of instructions to perform but the blog, including the comments, suggest a much simpler course of action. Some of the steps listed in the installation guide is not even required in my opinion. 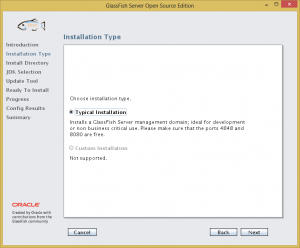 For instance, the installation guide included the upgrade of MySQL server as part of the Zenoss upgrade. However, as I found out after testing a fresh install of Zenoss 4.2.4, the MySQL version installed by the 4.2.4 auto-deploy script is the same as the one used by the 4.2.3 auto-deploy script. Therefore, I would assume that not all the of the listed actions from the installation guide are totally necessary. Let’s try the simplest upgrade as suggested by the blog. Grab the 4.2.4 installer rpm. At this point, as I understand it, there will be some problems with passwords not matching in configuration files, because the auto-deploy scripts (for both 4.2.3 and 4.2.4) would perform password synchronization, which is not done by the RPM. Let’s check them. The password in the hubpasswd file should match the <some other password> in global.conf. So let’s change it. Finally, start the zenoss service. Already using persistent sessions or using custom session storage. zope.conf will not be altered. And the upgrade is done! The ‘localhost’ device started to give out warnings in Zenoss that the zen processes are not running, but after a remodel of the device, the warnings stopped. I have not been checking up on Zenoss updates since my initial installation a few months ago. I did not realise that Zenoss released a bugfix update 4.2.4 in July. My 4.2.3 install has been working well so far, and I plan to update to 4.2.4 soon. However, firstly I want to revisit the process of installing a fresh version. I will repeat the steps of my 4.2.3 installation, and see if anything changed. Start with a minimal CentOS 6.4 installation. Then disable SELinux. Remove the mysql-libs package that has been installed as part of the minimal CentOS install. Install wget and grab the Zenoss 4.2.4 auto-deploy script. Go into the unpacked directory and run the auto-deploy script. Welcome to the Zenoss Core auto-deploy script! 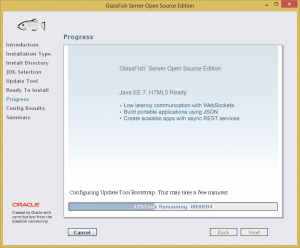 This auto-deploy script installs the Oracle Java Runtime Environment (JRE). Hit Enter, read the agreement, and press q to exit the agreement page. Type yes and press Enter to accept the agreement. The install will proceed and finish successfully. Zenoss Core 4.2.4 install completed successfully! Thank you for using Zenoss. Happy monitoring! Finally got SSL running on this blog. This post is to document the steps I took. This wiki page was what I used as a guide. OS is CentOS 6.4 running Apache that is packaged together with the base repository. The installation of mod_ssl will include a default https configuration with pre-generated key and self-signed certificate. Restarting httpd at this point will give you a working https page served with the certificate mentioned above. Do not forget to add firewall exception for port 443. Browsing to this page will show a security warning on browsers because the certificate used is not issued by a trusted certificate authority. To get rid of the security warning, we have to sign our key with a trusted certificate authority. Now let’s move on to generating our own key and getting it signed. Generate key using openssl (change 1024 to 2048 or higher for better encryption). Now, generate a certificate signing request (CSR) for the key. The command will prompt for further details to be embedded in the CSR. The output file ca.csr will then be sent to a certificate authority for them to come up with a corresponding certificate. You can also sign your own certificate using the following command. After you have received the certificate, either from the certificate authority or via self-signing, the CSR file is no longer needed. Now, copy the key and the certificate to the corresponding directories (so SELinux contexts can be applied without much tinkering). Next we can start configuring apache to use the certificate and key. This can be done either in the main SSL configuration file at /etc/httpd/conf.d/ssl.conf or in the VirtualHost records. Finally, restart httpd and your https page will now use the new key and certificate. If the certificate comes from a trusted certificate authority, you will no longer get the untrusted warning.